This wispy, airy tree is very beautiful and does well in tough desert conditions. A deciduous tree by nature, this Acacia can reach 20-30' high and spreads to near 20'. Leaves are bi-pinnate and filter sunlight rather than completely blocking it. Fragrant, yellow, puff-ball flowers cover the tree in the spring. 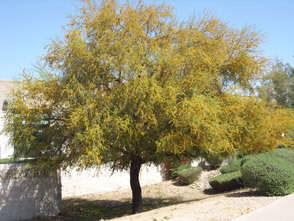 This tree is native to the desert southwest and does exceptionally well there.